Cradled in the peaks and rolling hills of the Andean Mountains, the lake that shelters Isla Victoria is truly one of the most spectacular – and little known – adventure travel destinations in the Americas. The sights that surround Isla Victoria are well-worth the voyage, no matter how long and arduous. A long, narrow glacial lake is bordered by steep hills and perpetually ice-capped mountains, with thick boreal forests that stubbornly climb their massive flanks. The highest of the peaks is the Tronador; meaning “thunder”, this old volcano takes its name from the rumbling made by giant slabs of ice sheet as they periodically fall, crashing down its mountainside. In this part of Argentina’s remote Patagonia – a place where the very name evokes a sense of wildness and wonder – the air is bracingly fresh, it can snow in the summer, and it seems very, very far from anywhere familiar. 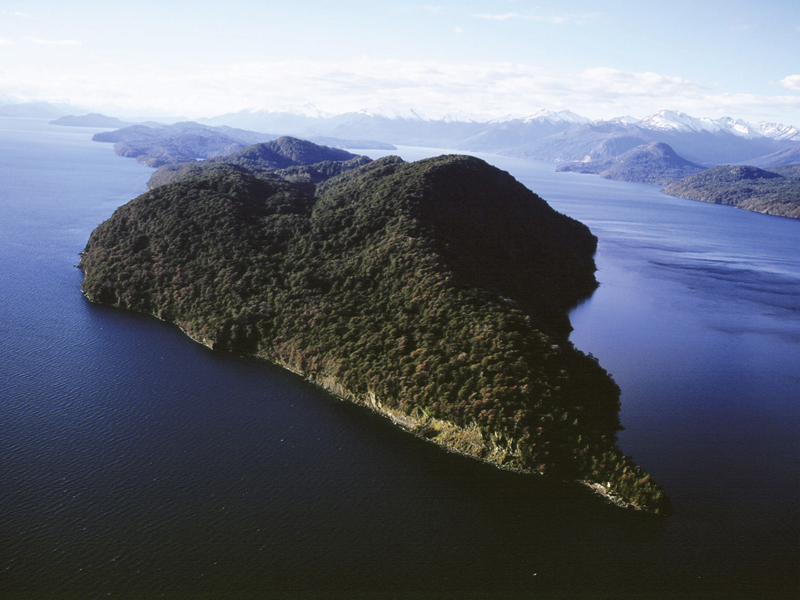 The deep, cold waters of Lake Nahuel Huapi are home to numerous islands – some tiny islets peaking above the water, others epic, semi-submerged mountains – but the 31 square kilometres of Isla Victoria have no comparison. Mirroring the shape of the lake itself, the island is long and lean, with a central ridge 1,000 metres high, and a width of just 200 metres at the narrowest. The island’s topography is diverse, with flower-filled meadows, ponds and streams and heart-stoppingly sheer cliffs. Summers see warm days, reaching into the mid-20 degrees Celsius, but when the sun goes down, even at the summer peak temperatures can still plunge to just above freezing. To those who visit the island, its wildness is no doubt part of the attraction. Argentina’s government has divided the island into 3 parts; a narrow central isthmus where tourism is permitted, a wilderness reserve where small groups are allowed to visit and walk the forest paths, and a large environmental research area where entry is forbidden. 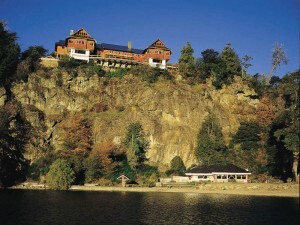 On the isthmus, Isla Victoria’s luxurious 22-room inn, owned by Mare Sur Hotels, sits atop a hillside, ensuring every suite has unforgettable lake and mountain views. Designed to merge with the natural scenery, the lodge has a rustic wood-paneled exterior that belies the luxury within. 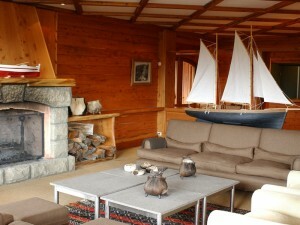 Every imaginable amenity can be had at the Victoria Island Lodge – a pool, Jacuzzi, well-stocked bar, gourmet meals, massages, and exquisite high thread count linens make the inn an oasis of civilization within Nahuel Huapi’s wilderness. The interior is decorated in a charming country style, with indigenous needlework, antique model ships, and comfortably plush furniture, while the bedrooms are finished in a clean and modern chic. In the stone-walled basement, a sophisticated tasting room provides a glimpse of the incredible wines making Argentina’s vineyards world-famous. 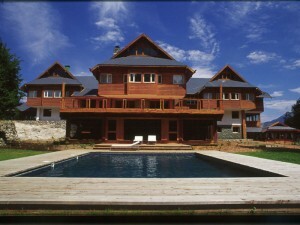 As luxurious as the lodge may be, in Patagonia, what lies outdoors will always be the main attraction. 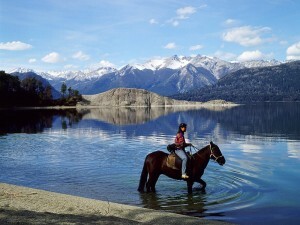 Guests can ride by horseback through trails along epic cliffs and within the dark pines of the surrounding Grimm Forest, and a variety of nature treks are organized by the resort; for those seeking a true adrenaline rush, mountain biking, mountainside skiing, and rappelling are also available. Of course, adventure does come at a price – the rates for exclusive use of the inn start at USD $11,400 per night, but rooms can be had for just over $1,800 a week (per person). It’s difficult to imagine a more perfect eco-tourism destination – surrounded by the epic beauty of Patagonia, Isla Victoria is a rare retreat where adventure can be seen out of every window.